Selfies are all the rage it seems that people cannot get enough of taking photos of themselves. There is one way to make those myriads of selfies look even better. 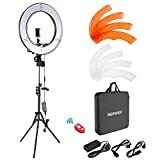 All you have to do is use one of the top 10 best ring lights with stand in 2019. 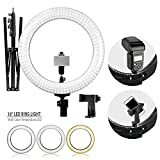 These top-quality ring lights can bring out the best in you. All you have to do is set them up, turn them on, and take your picture. You should end up with a bright-colors and every detail clearly seen in your photo. That makes posting your photos on social media outlets even more fun. Make someone jealous of your selfies by using one of the best ring lights on the market today. You probably can’t beat the quality outside of using a professional photographer. With 3 light modes, you can catch all the detail in your next selfie photo. Plus, with 11 adjustable brightness levels, you can make sure your eyes pop when you click the shutter. Then with the right setting, you can remove shadows that plague a lot of daytime selfie images. Also, the adjustable ring light not only holds your phone, but it also extends between approx. 17 and 52 inches in height. More good news is that it is compatible with most modern smartphones in use today. You get 360-degree rotation and adjustable viewing features as well. The controls are on the included USB cable. One drawback is that the entire stand may be a bit flimsy and weak. Another is that the lack of instructions hinders learning how to set it up correctly. Last, you may get some glare off your glasses. With LED light coming in between 3200K and 5600K, your images should turn out great. Plus, the phone holder rests inside the light helping you capture the light’s full potential with ease. Brightness adjustment is easy. Just turn the knobs till you get the color and brightness level you need. 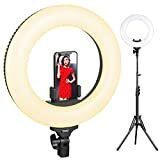 In addition, this ABS constructed ring light can double as a make-up light. You won’t miss a spot when you get enough light on your face. On top of those features, the ring light can reach up to 6 feet high. It is compatible with most DSLR cameras and smartphones. One negative aspect of this ring light is that it does get quite hot. Next, the carry case has no protecting dividers or pockets. Just one big pocket for everything. Last, the plug-in may not insert all the way in. With the controls on the USB cable, your selfie picture taking should be a lot easier. No more stretching your arm out to grab a quick shot. Then the 6” ring light uses 3 light modes and 11 brightness levels t help you get your perfect shot. 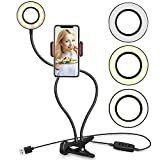 Plus, the separate cell phone holder provides you with a variety of placement options to maximize the ring light’s usefulness. After you get ready, you can adjust the ring light’s tripod base to get the right angle for your image taking an adventure. A USB cable handles all the power source duties. One drawback to this ring light is its size. It may be a little smaller than what you need. Another one is that the phone stand may be missing from the box. Finally, you need lots of room to use the light and the camera stand at the same time. With roughly 250 LED light chips staring at your face, you should get enough light to nap a quality selfie. Plus, their wide brightness settings give you plenty of options to be creative with the ring light. Because they are LED light chips you can expect up to 70,000 hours of use. Also, the adjustable light stan helps you get the right angles for the 3200 to 5600K light. Shadows will be a thing of the past. On top of that, the phone holder and your controls lie in front of the ring light for easy access. One disadvantage to this ring light is that its small size limits your camera or smartphone options. Next, the warranty coverage may be weak and not in your favor. Finally, the adjustable light pole seems to be quite weak and fragile. The 18-inch diameter should give you enough space to get that perfect selfie you always wanted. There is room inside to fit your smartphone for better pictures without the nasty glare. Plus, the Bluetooth shutter makes it easier to snap your selfie. In addition to all of this, the adjustable pole gives you 360-degree rotation. Getting the light just right is not that difficult. Then the multiple brightness levels let you capture your perfect look. 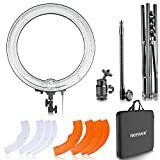 After you decide to purchase this ring light, you get a carry bag to make sure the light and its accessories are nice and safe. One drawback to this ring light is that it may not sit completely level and will tilt to one side. Another is that the smartphone holder may not tighten as much as it should. Last, the adjustment knobs may not work that well either. 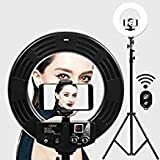 While you need to be careful as you assemble this ring light you should get enough light to handle your selfie-taking duties. Made from aluminum, the stand is lightweight but durable. It should hold up through different photo sessions. Also, the adjustment capabilities allow you to place the light exactly where you need it to be. Plus, the 18” light gives you flexibility in brightness and color. With its foldable nature, you can pack it up and store it with ease. The ring light works well with a selfie stick and provides you with the look you want. One negative feature is that the foldable stand may not be as sturdy as you would want. Next, you do not get much dimming range with this ring light. Finally, some of the plastic pieces may be of inferior quality and break easily. A 14-inch ring light will still bring you enough light to improve your selfie shots. Plus, with up to 5500K light, you should capture every detail in your surroundings. The 240 LED light chips make sure you get more than enough brightness and dimming capabilities. One way to make selfie picture taking easier is the included Bluetooth. You can be out of arm’s reach and still snap your photo. Then the foldable tripod gives you lots of adjustment options. This way you get the right height and angle for your next selfie shot. It is compatible with most smartphones and digital cameras. One disadvantage with this ring light is the cell phone holder may be too small for some electronic devices. Another is that the tripod legs may not be strong enough when weight is put on them. Last, the ring light attachment bar does not tighten as well as it could. Also, the 24” gooseneck design gives you 360-degree rotation as well as a myriad of angles to choose from. With the 3 light modes and 10 brightness levels, you can customize your surroundings. The power cord holds the easy to use control panel. Just a touch of your finger gets you the selfie you want. One drawback to this ring light is that the nuts may lose their holding power. Another is that some smartphones may be too heavy for the gooseneck design. Last, the light creates weird lines in your photos. One good thing about having different brightness levels to choose from is that you can customize the light surrounding you. This gives you some creative control over your selfies. Then the 240 LED light chips provide you with roughly 3200K of light. In addition to those features, you get 360-degree rotation and between 36 and 78 inches of height adjustment. Plus, you get orange filters and a Bluetooth shutter. The lightweight tripod is easy to fold up and carry to your next destination. Also, the phone holder does rotate 360 degrees as well. 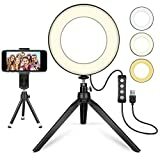 One negative item with this ring light is that the shutter may not work after a while Second, the ring light may have connection issues and lose its power. Third, the quality control issues do mount up and ruin the quality of this ring light. A Bluetooth shutter release makes selfie-taking more fun. No more stretching your arm out to get that great photo. Just click the button and the photo is taken. Also, with 5500K light, orange filters and up to 240 LED light pieces, you should get enough light on your selfie subject. On top of that, the 1 to 100% brightness capability allows you to adjust your lighting to fit your surroundings. Plus, you get a handy carrying case that has a separate box for the foldable and adjustable ring light pole. Your ring light is safe when you transport it to another location. The first negative feature of this ring light is power issues. Sometimes it won’t turn on. Another negative feature is the orange filters. They may turn your selfies orange instead of providing good filtered light. Finally, a short in the wiring may stop the power flowing. Just setting up a light and turning it on doesn’t necessarily bring you the creative look you want. 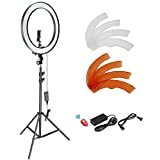 When you turn to one of the top 10 best ring light withstand in 2019, you want to use it in the best way possible. A subtle touch- use the brightness levels to lower the light to fill in certain areas that are not bright enough. You do not want to overpower the natural light around you. Framing your subject- ring lights are great at putting a frame around your subject and highlighting those parts you want everyone to see. Highlight difficult details- some subject matters are harder to see than others ring lights can bring out those difficult detail and make your selfie a lot more interesting. Create a catch light effect- ring lights are good for this and help you bring in better details that illuminate your subject and get your message across. Create a halo effect- brighten your subject y making them look more angelic than they really are. A ring light works well as a key light. Upgrade macro shots- ring lights have brightness levels and the brighter the light the better your smaller items will look. Add a soft light effect- again, the brightness levels and light modes help you be creative with your selfies and give your images a nice soft light touch. 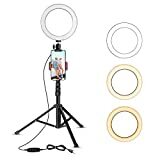 Now that you know all about the top 10 ring lights with stands in 2019, you can take the right steps to improve your selfie images. The right equipment can enhance your creativity by making you a better photographer than you give yourself credit. With a top ring light working with you, you can highlight little details, or remove shadows with ease. Then with their Bluetooth shutters, you do not have to look awkward in the photo. 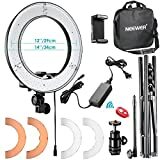 Using one of the top 10 best ring light withstand in 2019 is a great step forward in your selfie-taking career. Who knows, you may take that perfect selfie everyone wants to have.